I suspect it may not have been the best idea to read the middle novel of a trilogy-series, but Mike Nicol does pretty well in involving the reader so that one doesn't miss references to the characters' past exploits. Killer Country, the second of the three Mace Bishop and Pylon Buso novels, focuses more frequently on Bishop, whose family has been under threat before and is here again. Bishop and Buso are former freedom fighters (of two different races) who now run a security agency (mostly bodyguarding tourists uncertain of their safety in the wild-west milieu of Cape Town). In Killer Country, they are seduced into a job that is outside their comfort zone, to do a security assessment of a judge's father's farm (there have been many farm killings in the country). They are also trying to nail down the last element of a land deal of their own, to develop a golf community, but a well connected and ruthless (also former freedom fighter) businessman currently in jail for fraud is also trying to tie up the same land. The "uber-nemisis" of the series is also lurking behind everything: a woman they interrogated with violent and crippling results in the camps of their freedom fighting days, who is now an influential lawyer. Also in the mix is a cold-blooded assassin and his not-so-controllable driver and minder, down from Johannesburg. The two threads of the story inevitably become connected, with violent results. Bishop proves to be rather careless at times, not the super-competent bodyguard of some thriller series, and pays for his inattention several times over. Nicol writes very well, and he manages to evoke many aspects of the multi-cultural and troubled country while keeping the story colorful and fluid. I found, though, that I didn't much care for the not-so-heroic heroes and (perhaps part of the author's point) could see things from the nemisis lawyer's point of view. While not as compulsively readable as, for instance, Deon Meyer's recent 13 Hours, Nicol is in the best tradition of current South African crime writing (and there's a very high standard of crime fiction coming out of the country right now). 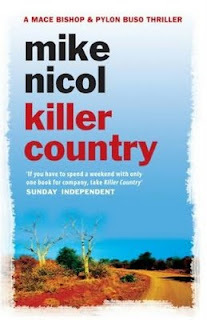 Nicol pays homage to George Pelecanos explicity, and like Pelecanos, he offers a playlist based on both Bishop and the assassin's taste in "killer country" music.